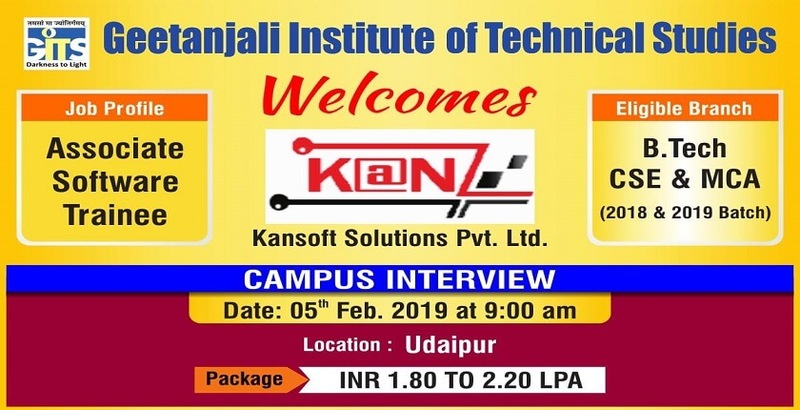 GITS is organizing Campus Interview of Kansoft Solutions Pvt. Ltd. (KAN software) to recruit GITS B. Tech CSE and MCA students of 2018 & 2019 Batch for Profile of Associate Software Trainee @ Package of INR 1.80 to 2.20 LPA on 05th February 2019 at 9.00 am. KAN Software an offshore software development and IT outsourcing company was started in 1999. KAN Software, mainly a software consulting firm provides ERPs and business solutions to various sectors across the globe. It is headed by well-known computer professional Mr. M.L. Talesara, M.Tech. (Comp.Sc.) Gold Medallist from BITS, Pilani. In the last few years of its existence, KAN Software has achieved the status mark of a reputed software development company by gaining immense experience in undertaking and implementing a wide range of engagements with reputed organizations and firms such as DEN Snapdeal, Videocon, IIFL etc. with great success. Our Business CRM Applications in Ecommerce and Teleshopping domain has made a strong footprint and presence in the B2B segment. 1. Knowledge of C#, ASP.Net, VB.net, JS, Angular JS, MVC, JSON. 2. Knowledge of coding and programming. 3. Excellent communication skills in English. 1. Knowledge of Java, Android. 3. Develop/Translate designs and wire-frames into high quality code and application. 4. Design, build, and maintain high performance, reusable, responsive and reliable application using tools such as Android studio, Ionic. 5. Excellent communication skills in English. 1. Knowledge of Manual Testing. 2. Execute test cases and analyse results. 3. Evaluate product code according to specifications. 4. Report bugs and errors to development teams. 3. General/Technical/HR Round Selection Criteria: Selection will be purely on the basis of outcome of interview process.